Hamburg's new landmark concert hall "Elbphilharmonie" will be built as part of the "HafenCity" (harbour city) development, at a cost of ~$230M. People are so enthused about the project that the City of Hamburg already collected a quarter of this amount in donations - before even starting the campaign. The red brick base of the building is a warehouse structure designed and built in 1963-1966. Part of the brick sturcture will become a parking garage. 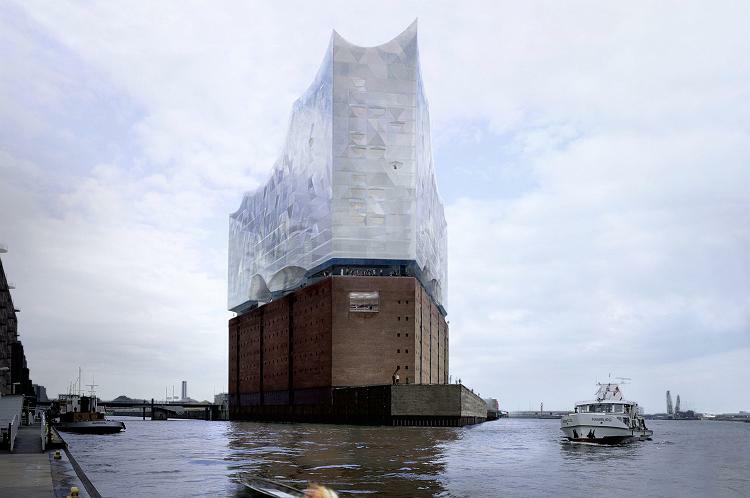 The new (top) part will host a hotel, appartments and two auditoriums for 2,200 and 600 people behind its glass facade, it is designed by Swiss architects Herzog & de Meuron . The project is set to complete in 2009. There is a small English writeup, as well as a longer article in German. There is also a wicked cool slideshow. German Parliament has approved the plans, and it's apparently green lighted. People who would put a 40-story Gehry building in the East River: please take note on how to do a beautiful river building.